There are a lot of fun Halloween things for kids to do in October — especially on Halloween night. Kids love to dress up and go trick-or-treating. Parents have fun too. They love seeing their little ones in costume and safely watch over them as they go door to door. And adults enjoy Halloween costume parties, as well. But what about your dog? How much fun is Halloween for dogs? Dogs and stress go together like fire and water and you won’t want your dog to be stressed during this holiday — or any holiday for that matter. According to the American Humane Society, incidents of dogs being burned or poisoned after eating candy increase substantially during Halloween. Keep in mind, your dog is part of your family and you are his pack. He trusts you to keep him safe, as you are the Alpha dog. Of course, you wouldn’t want your dog to become ill or injured due to your own negligence. That’s one of the reasons the American Humane Society recommends keeping your dog indoors and away from the commotion on Halloween night — to prevent him from becoming frightened, stressed or injured. 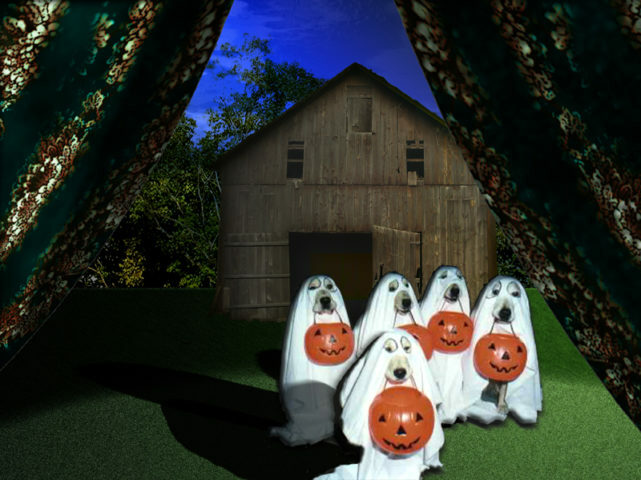 Be sure to take your dog out to pee and poop before spooks and ghouls begin constantly ringing your doorbell right after dinner. Strangers in spooky costumes will be coming to your door for hours. This can lead to vomiting, diarrhea or even submissive urination in some dogs. Likewise, an otherwise docile pet may experience canine aggression on Halloween from all the excitement and confusion. Any open door gives your dog an opportunity to escape. Make sure that your dog is wearing a collar and ID tags, just in case he slips away momentarily or escapes and becomes lost. Many pets are lost on Halloween night. Don’t let this happen to your dog. Keep all forms of candy out of your dog’s reach. 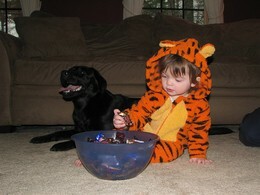 Candy (especially chocolate) is toxic to dogs, as they don’t have the stomach enzymes to digest it. Don’t allow your dog to become a statistic. Be sure to have your dog’s favorite dog treats on hand, and that’s all. Don’t send your dog out trick or treating with your kids. That’s a parent’s job, not a dog’s job. Young children aren’t capable of caring for a dog when spooky ghosts and goblins are flooding the streets. If he gets loose and becomes confused, frightened and disoriented, he may even bite out of fear. Dog bites are serious and all dogs who do so are looked upon as a threat — in the neighborhood, and in society as a whole. Never dress your dog in a pet Halloween costume. These are often uncomfortable for dogs, not to mention the fact that elastic can become twisted in the dog’s fur and cause swelling. Your dog may decide to chew on the costume, and he may even eat parts of it. This can lead to intestinal blockage. Keep decorations, electrical cords, spider webs and streamers hidden and out of reach from your dog. Chewing on these can cause dogs to become seriously ill or even die. Things like streamers and spider webs can choke off the intestines. If your dog chews on electrical cords, he may become electrocuted. It’s up to you to do everything you can to keep your dog safe this Halloween. Use the tips in this article — and common sense — to ensure that both your family and your dog have a safe and happy Halloween.